This week, YouTube redesigns its gaming page to compete with Twitch and announces it’s going to kill the YouTube Gaming app, Sony announces the Playstation Classic, and Spider-Man’s massive sales spark a discussion around AAA, single-player games. In a further effort to compete with Twitch for the live games broadcasting crown, YouTube redesigned its gaming portal to mirror some of its competitor’s functionality. Engadget reported that the redesign also borrows heavily from mobile app YouTube Gaming, which will be shut down next March “due to its limited reach.” The reporter cites that most YouTube viewers preferred the standard YouTube mobile app instead of the YouTube Gaming standalone app, and would rather use the platform to watch pre-recorded content such as Let’s Play videos instead of live streaming. The Verge interviewed YouTube’s director of gaming content and partnerships, Ryan Watt, who admitted that most users didn’t even know what the app was for or what kind of content it served. The new redesign, baked into the main YouTube app and site, features “faster access to top live streams, pages for specific games, and a new ‘On the Rise’ section that highlights up-and-coming creators.” The Verge points out that the service will receive a staggered launch beginning in the US first, as “the system relies on both algorithmic and human curation, and scaling that model will take some time.” Kotaku is pleased to see YouTube implementing “more focused curation features” on its main site, but that it seems like too little, too late to really challenge Twitch’s monopoly on livestreaming games. Taking obvious cues from the runaway success of Nintendo’s NES Classic and SNES Classic, Sony announced the new “Playstation Classic,” a miniature version of the retro console featuring 20 built-in games. So far, only five of the 20 planned games have been announced, including Wild Arms, Final Fantasy VII, Tekken 3, Ridge Racer Type 4, and Jumping Flash. In their wishlist for the remaining 15 games on the platform, IGN points out that many hallmark Playstation One titles, such as the Spyro and Crash Bandicoot series, have already received recent HD re-releases and that the Playstation Classic would be better served digging deeper into its library for other revered titles. They also point out that the lack of a DualShock controller likely means that classics such as Ape Escape (which relied on the controller’s joystick functionality) will not be making an appearance in the console’s limited library. Polygon notes that a common complaint regarding the NES Classic and SNES Classic was that users had to hack them if they wanted to add any additional games to the library. They speculate that the plastic cover on the back of the system could possibly be hiding something like an Ethernet port for users to add classic titles they’ve purchased from Playstation Network. The console comes with two controllers, releases on December 3rd, and is available for pre-order now for $100. Tech review site Tom’s Guide points out that Nintendo’s classic consoles’ extensive, acclaimed libraries and cheaper prices makes the Playstation Classic’s price tag a bit off-putting comparatively. 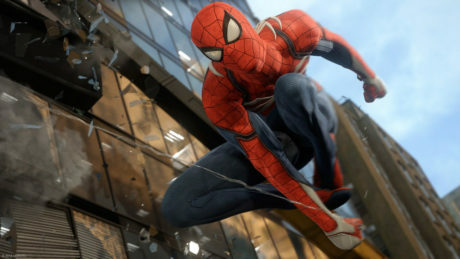 Earlier this year, God of War’s record-breaking sales sparked a discussion (in publications like Comicbook.com and ScreenRant) around how a traditional, standalone, single-player, $60 game with a strong narrative and no microtransactions can still be a massive success in a marketplace seemingly dominated by multiplayer and “games as a service.” Spider-Man’s recent record-setting sales seem to further that narrative as 3.3 million copies were sold in its first three days of release, effectively out-grossing the opening weekend of the recent, hit film Spider-Man: Homecoming, breaking God of War’s recent record of 3.1 million copies sold in the first three days, and setting an all-time record for Sony exclusives. Gamespot, GameRant, and Destructoid all point out that the game’s financial success seems to be on par with its exceedingly positive reception from fans and critics alike. GamesIndustry.biz reported that the game’s second-week sales topped first-week sales for Shadow of the Tomb Raider and NBA 2K19, two new installments in two incredibly popular series.